They moved from one flagship software product to adding one piece of flagship hardware. Now there’s a flagship event, too. It’s called “Loop,” and it will be held 30 October – 1 November in Ableton’s headquarter city of Berlin. It’s clearly in part a summit for the Ableton Live community. But just as their recent book covered the creative process rather than Live per se, the event is pitched a convergence of creativity and technology generally. It’s not just talks or demos, either. The event organizers are combining hands-on workshops and invites educators. There’s also a collaboration with CTM Festival to set up evening performance programming. Loop is three days of performances, talks, and interactive workshops aimed at exchanging ideas at the cutting edge of music, creativity, and technology. 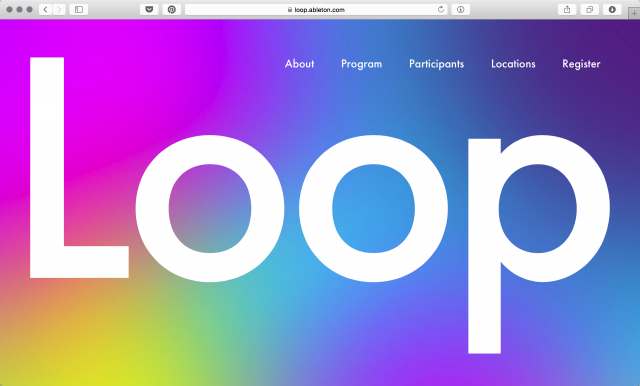 Bringing together artists, technologists, and other creative thinkers, Loop is a collective exploration of what it is to make music today and what it could be tomorrow. Talk titles include how to overcome creative blocks and how to get in the flow and what music looks like beyond genres. As in Dennis DeSantis’ book, there are deep discussions of what loops and repetition mean, how they relate to traditional drumming, and how to escape the grid and presets. I’ve been told these are just a few of many more topics and speakers to come. Already in the speaker list (apart from yours truly) are (of course) Robert Henke, Holly Herndon, Henrik Schwarz, King Britt, James Holden, Money Mark, Young Guru, Dauwd, DJ / rupture, Daniel Miller, Matthew Herbert, and Electric Indigo. There are also people like researcher Rebecca Fiebrink, who is doing ground-breaking work in interactive machine learning and has an unparalleled research and development background. Actually getting into Loop if you aren’t a speaker will be a bit of a challenge. There are only 400 participants in total, with registration by lottery. To maximize diversity, they say they are also grouping tickets by age and genders. There are links provided for SoundCloud and the like, though with the stated intention of seeing if you’re doing something – that is, it isn’t an audition. Tickets are 250€ for a full ticket, though if you’re 18-25, it’s 100€.